Finding the right makeup color palette might seem simple and intuitive for green eyes, but there might be some combinations that you haven’t considered. If you really want to make your eye color pop, discover some makeup tricks for green eyes that will help you achieve stunning look for day and evening. Around 1-2% of the entire human population has green eyes and the color is more common in women than men. Whether you’ve got light green eyes or their irises have spots of gold for a hazel effect, check out the right way to make them look stunning. The basic principles of the color wheel apply perfectly for your color choice. A simple way to highlight your green eyes is to stick to neighboring shades of green. The most stunning looks are often the ones that feature complementary colors, with purple being the most impressive choice for eyeshadows for green eyes. The key to finding the right look is also taking your hair and skin color into account. When your skin and hair are light, you shouldn’t go for saturated colors, especially if you’re not looking for a dramatic look. Light purple is great, but so are shades of taupe, peach, tan or teal. According to the best makeup tricks for green eyes, a more striking look can be achieved with gray. If your skin and hair are darker, your best choices are mauves, darker teals and brows. You could also rock forest green, but you’ll get a very dramatic effect. Earthy browns can help you create a truly gorgeous makeup for your beautiful green eyes. Golds, medium greens, copper, plums and neutral browns are some of the best color choices you can make for medium skin and hair color, whether it’s a dark blonde or an auburn red. Brunettes have a higher success rate with medium grays, purples and neutrals that still offer a bit of contrast. It’s easy enough to pick complementary greens that flatter both your skin and hair, but when it comes to purple, things get a bit more tricky. Purple looks great on every eye color, but it truly pops when it comes to green eyes. They key to finding a good purple is not going too cool with it. Avoid any purple with blue undertones, since it can easily make your eyes look washed off in comparison. Find a purple with red undertones or stick to a more grayish purple if you’re looking for a more subtle look. 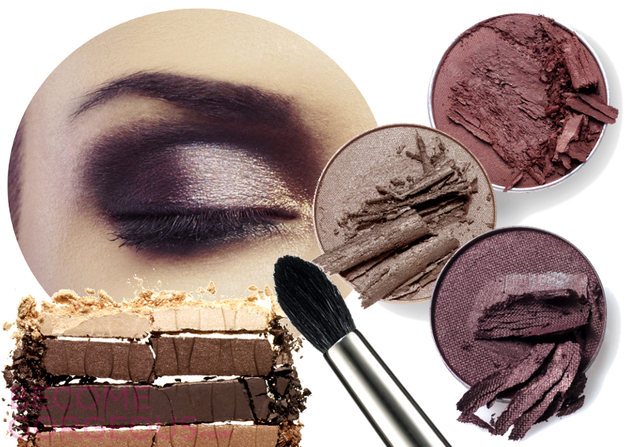 You can easily create flattering looks with multiple shades of purple, simply by placing them correctly and using a few makeup tricks for green eyes. For close set eyes, go with lighter shades at the inner eye and darker at the edges. For wide set eyes, do the opposite and you’ll get a more glamorous look. If you want a shimmery finish for your eyes, you can choose from almost every shade of metallics. Gold, bronze and copper suit greet eyes perfectly and any of them can be the perfect choice for evening makeup. The one should should stay clear of is silver. It’s way too cool for green eyes and you might like the effect, but it’s never really flattering. Black can be too overpowering for green eyes, for both eyeliner and mascara. If you absolutely love using black, one of the best makeup tricks for green eyes is to go for the softer and more muted shades, including charcoal. Eyeliner for Green Eyes: Go for brown or slate gray and you’ll create a much better looks that suits your green eyes. You might get aways with black for evening, but daytime looks aren’t really going to work with very dark eyeliner. To create the right look, you can also mix shades, by using a charcoal pencil eyeliner and topping it off with a slate gray liquid one. For brown, go with espresso or other warm shades that really highlight the color of your eyes. Mascara for Green Eyes: Black is to be avoided, but if your heart is set on it, stick to just one coat on the top eyelashes. The full black look is much less flattering than you’d think. Dark greys and brown can give you a lighter look that really flatters your eyes.